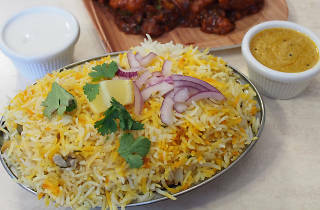 If the sight alone of pyramids of tandoori chicken pieces, slow braised pieces of goat on the bone and deep fried green chillis in batter doesn’t swell your eyes with spice infused tears, then the house special Hyderabadi chicken biryani at Swagath Biryani House will certainly finish the job. A favourite of the royal kitchens from the 16th century Mughal empire that ruled across the Indian subcontinent, cinnamon and clove infused rice is layered over pieces of chilli, cardamom and turmeric marinated chicken, then slow cooked until the flavours merge together. This Western Sydney house of rice might be a long way from those regal dining halls, but they’re still serving up fluffy hollocks of basmati, which after a little digging through the layered rice reveals pieces of fragrant cardamom scented chicken hiding underneath. Don’t skimp when spooning out the nutty mirchi ka salan, a mild peanut sauce, and the cooling onion and yoghurt raita sauce, both served as extras. Chicken not your meat of choice? The options extend to mutton, fish, lamb and vegetables. If you are lucky to nab a table at this popular Southern Indian establishment (they’ve only got five), start off with ordering a cold salt lassi, the usually sweet yoghurt drink is extra refreshing when a touch saline. In it for the sugar? There’s the sweeter mango option too. The most popular entree is the curiously named Chicken 65, a dish with multiple origin stories, from the year it was invented to the number of chillis in the sauce or the days the chicken was alive. It has roots in both Hyderabadi and Chennai-style cooking, popular as a snack or entree. These bright ruby red nuggets of lightly battered and deep fried boneless chicken carry just a touch of vinegar, salt and chilli. The ardarka lasoon gobi takes small florets of cauliflower and fries them with chillies, mustard seeds and garam masala and then coats them in a hot and slightly sweet sauce, enough to make you order another lassi. Follow it with the house special biryani and include a curry for extra kicks. The Hyderabadi goat curry is fall apart tender pieces of meat cooked on the bone. It’s dark brown from the slow cooking and the mix of onion, cumin and fenugreek seeds and fresh curry leaves infuse the sauce with a fragrant depth. Don’t forget a roti or naan for mopping up the curry – branch out with the fruit and nut filled Peshwari naan that dances between sweet and savoury. Dessert options include gulab jamun, those super sweet dumpling balls with rosewater syrup, or milky kulfi ice cream. But our pick is the bright orange gajjer halwa – a heated mix of grated carrot, sugar, cardoman and milk cooked down into a soft and luxurious pudding. Wentworthville is home to a score of Indian and Sri Lankan eateries, with a large supermarket supplying fresh and imported subcontinental goods. 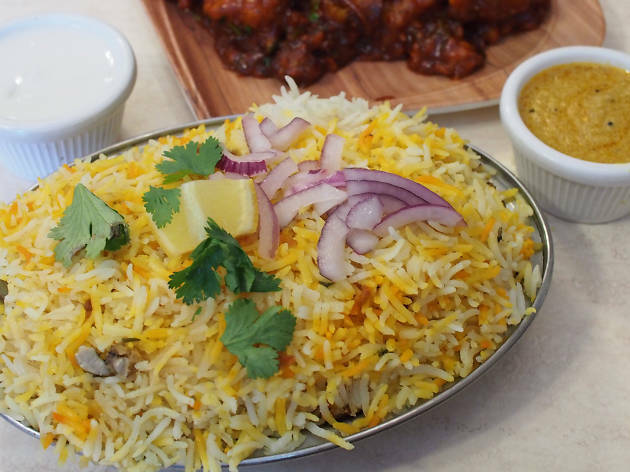 With homestyle biryani like this, it’s no wonder there’s often a wait for a table in the narrow storefront eating space. The place buzzes just keeping up with the takeaway customers out the front, picking up a taste of home. If you need to cater a crowd, you can always take home a mighty bucket of biryani, enough to feed fifteen people for just over $100.